Windows updates (service packs and hotfixes) are very important to keep system updated and secure. However, sometimes an update can cause more trouble than good on the system. 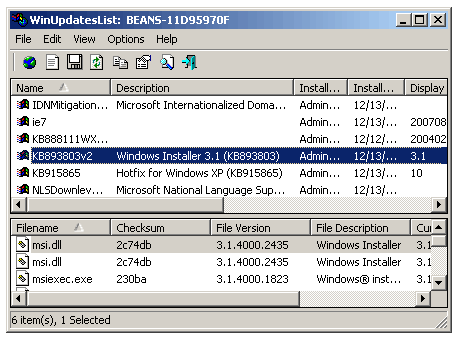 WinUpdatesList utility allows you to see list of Windows update installed on the computer. You can clickÂ individual update listing to see associated files in the second viewer window at the bottom. You can right click and visit specific Microsoft webpage for that update. It also allows you to uninstall and remove any update using File menu option. You can copy updates information to the clipboard and save it to text, HTML, XML file. Download WinUpdatesListÂ [link], it is a self excuting file and does not require installation – just unzip and double click to run the application. It works fine on Windows 98, 2000 and XP, does not work on Vista.